A tiny café in thrall to Hong Kong’s tea-houses. Please note, Duck Duck Goose has now closed. Time Out Food editors, March 2019. 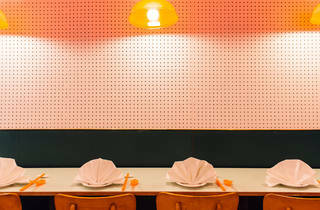 The teeny-tiny interior of this Cantonese café, just off Pop Brixton’s buzzy central area (or clamorous first circle of hell, your choice) is very cute. Mahjong dice line the door. The walls are made from that Swiss-cheese pegboard you see in rural art shops. Giant plastic fruit hang around the space. Pastel shades abound across a sea of Formica. It’s quirky. I loved it. As I did most of the food. First, the big hitters. Go now for their prawn toast. It is epic. Gobstopper-sized mounds of light prawn mousse are wodged on to sesame-covered bread, fried into submission and covered in bonito tuna flakes, bitter frisée lettuce and pickled kohlrabi. Then zip forward an hour to the cha chaan teng French toast – a fried peanut-butter sandwich by another name. Elvis, understandably, died for this. It was paired with a painfully good, kulfi-dense peanut and soy ice cream. For these two dishes alone, Duck Duck Goose would be a worthy entry on any end-of-year ‘best of’ list. And the rest? Pretty great, but – and it’s a big ‘but’ – almost all over-salted. 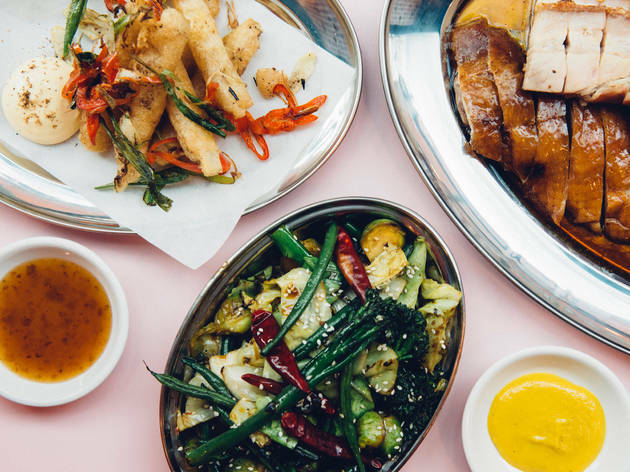 A plate of crunchy pork belly, roast duck and sliced char siu, swimming in drinkable sweet soy juices, was fab but for the intense sodium levels; likewise a dish of pork ribs with fermented tofu and wild garlic. Wok-fried greens should have been a fresh, chilli-smacked foil to both, but again. Alas! Fingers crossed they correct this simple mistake, as the cooking is on point otherwise; the pared-down menu thoughtfully crafted and the cocktails decent. Either way, it’s well worth braving Brixton’s drunken yuppie masses to get your beak around those toasts. 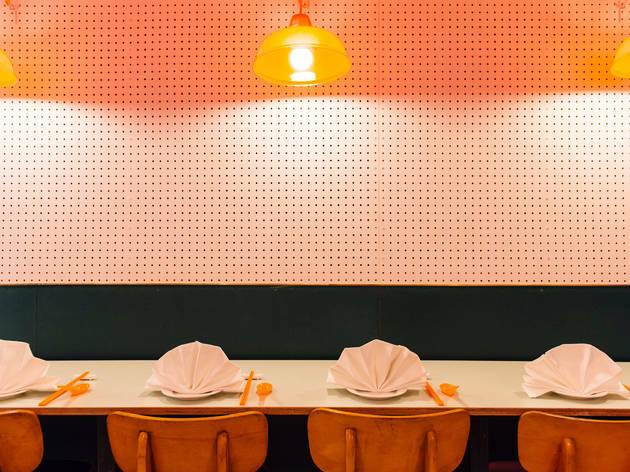 With the plastic orange retro chopsticks, booth seating and the peg board walls, the interior definitely pays homage to the cha chaan teng - Hong Kong style cafés which directly translates from cantonese to “tea diner/ restaurant”. I loved going to these diners when I was a kid because it meant that I could have more ‘western’ food - I guess it’s typical of a chinese kid growing up in a western society (read: a banana for those who know) and struggling with their cultural identity; which is quite ironic as now, as an adult, I can’t even go for a week without missing asian cuisine and rice. The service here is really friendly and relaxed, so quite different to the gruff efficiency that I’ve grown accustomed to (and often associated to) cha chain teng places in Hong Kong or even Chinatown. The prawn toast was good - with big chunks of prawn meat in it and crispy on the outside - the bonito flakes and mayonnaise on top were also a nice flavoursome touch to boost that umami. The greens had a good “wok flavour” - a term we use in cantonese where the ingredients take on the charcoal and heat flavour from the wok. The Cantonese BBQ selection was a little disappointing as the pork belly should have a crispy salty skin, but it was rather chewy. The roast duck, which I was really looking forward to, also failed to have a crispy skin and together with the fattiness of the duck and too much sauce it was all a little soggy. The Char Siu also lacked that sticky sweetness that usually accompanies the exterior. The BBQ flavours are definitely there; but it was lacking the delicateness of really really good authentic cantonese roast meat. The french toast with the peanut butter in the middle definitely brought back a lot of childhood memories. I would have preferred the toast to be a bit thicker (that’s probably just nostalgia hitting me), but it was definitely a lovely toasted golden brown and the ice cream balanced the sweetness of the french toast nicely. Taking a modern spin on such a nostalgic and traditional cuisine is always a difficult challenge and I really applaud these guys for taking a punt, so I hope they work on the BBQ meat and I’m sure I’ll be back to try more of their dishes again. Tip: get in early and if you’re a couple, get the booths on the side for a bit more room and comfort. At £30 for the selection of BBQ meat, it’s more of a sharing dish for 4. Had a great meal at Duck Duck Goose. The decor is reminiscent of the many cafes you find in Hong Kong, with additional quirky touches. The food was fantastic. The prawn toast was mouthwateringly delicious. The salsify was great too, so much so we had to order another portion. The meat and fish dishes did not disappoint - especially the duck and goose (though the goose is only available in the evenings). Charming and informative service. Good selection of wines to complement. Highly recommended. Such nice, unusual food- really tasty and fresh. I'll definitely be going back, especially for the lovely vegetables and seriously good french toast. Lovely decor too- tiny, cosy but cool. Loved Duck Duck Goose - slightly higher price point but fantastic quality ingredients and you can taste the difference. Cute and thoughtful decor with a cleverly designed to maximize space. 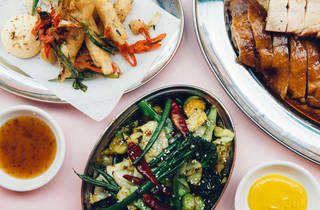 I really enjoyed the fish, prawn toast and the meats, brilliant flavours - will go again for sure.